Note: On this page is a reprint of a beautiful, very touching article on Bruce Heitz. The story and three pictures in full-color appeared in the Summer 2000 issue of Medjugorje Magazine, published quarterly in Westmont, Illinois. The colorful 68-page issue featured many spiritually and emotionally moving stories of people taking pilgrimages to Medjugorje, where 238 documented cures by the Blessed Virgin Mary's presence are of record in that special village. Permission to reprint the entire story and photos was received from the Medjugorje Magazine. Hearing the testimony of Bruce Heitz makes you look back over your own life and feel very blessed. It also makes you aware of the great Divine Mercy of Jesus. He never gives up on us. Bruce had many Catholic friends as a youngster so at age 15 he became a Catholic. Two years later, at age 17, he married his 15-year-old pregnant girlfriend in the Catholic Church. It was 1959 and in those days pregnancy meant you married, with the parents signing the papers giving their permission. Naturally there were big problems from the beginning so Bruce went to see a priest for help. "He slammed the door on me. I was so distraught I quit going to church." Now, instead of going to church, he joined a motorcycle gang. He was nineteen and by then a second baby was on the way. "Remember the movie 'The Wild One,' with Marlon Brando, a long time ago?" Bruce asked. "Like the gang in the movie, we raised a lot of hell, intimidating people, especially in bars, always looking for fights. We also stole motorcycle parts and then sold them." He was still living with his wife and children and working every day. His wife was a working mother. "I didn't need money. I just wanted to be in the club, belonging to the gang," Bruce admits today. The gang met thirty miles from Bruce's house so he spent long hours away from his family. In spite of this, the two of them hung in there together for seven years before getting a divorce. "By then, I was cheating on her and she was cheating on me." Bruce with Vicka and her mother. After the divorce, Bruce left Michigan and headed for California. About a year later, he met a nurse, she became pregnant and they married, outside the Church, of course. This marriage lasted only a year and a half. Their baby boy, Shane, was born with cerebral palsy. Bruce hadn't realized that his new wife was on drugs. She blamed herself for the baby's illness and tried to take her own life two times. The second time, as the authorities took her to the hospital, they told Bruce to keep the baby away from her or they'd take the child. Bruce got a second divorce. Now he had no place to turn for help. "My family turned their backs on me, saying they had their own problems. I worked through the system, looking for someplace to take care of my son during the day while I worked. The bottom line was that all I could get was welfare." Later, Bruce received a letter from Australia saying Shane's mother had immigrated there and relinquished full custody of her son to him. Bruce finally found a home in Los Angeles, that would care for Shane, along with two other handicapped children the family had taken in. They were good people - the husband was a minister. Unfortunately, one day they had a babysitter who invited her boy friend over, didn't watch the children and one child died. Bruce took his son to another home but there were problems again. He married a third time to a woman with three children. Finally he could bring his handicapped son home to live with him and his new family. This marriage lasted for twelve years. During most of those years, however, Bruce knew his wife was on a drug called "crank" but at least he had his son with him. Finally, though, when she wouldn't give up drugs, that marriage ended in divorce. Today, Shane, now an adult, is in a place called Hillside House. Bruce visits him every weekend and is vice-president of the parent's club there. Through all these years of broken relationships and pain, distraught as he was, Bruce never turned back to his church for solace or help. Then, one day at work in 1995, a fellow employee showed him a picture he'd taken while on a pilgrimage to Medjugorje. "He said he'd taken this spectacular photograph from the backyard of one of the visionaries, Vicka Ivankovic. 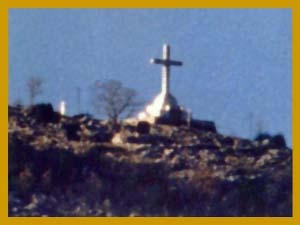 The photograph was a view of the Cross at the top of Mt. Krizevac. The time was approximately 9:00 in the morning. My friend, Tony, had a telephoto lens and the distance to the cross was about a mile or more. What he saw through his lens was the Blessed Virgin Mary praying to the left of the cross. When he had the photograph developed, there she was. I was so moved by seeing this picture, I decided to go back to Church after 30 years." On the top is the photo Tony took, on the bottom is Bruce's painting. The following year, Bruce went to Medjguroje with Tony. "I borrowed money from my credit union so I could go." God used many signs to touch his heart. He took several pictures and on his return saw one he found interesting. 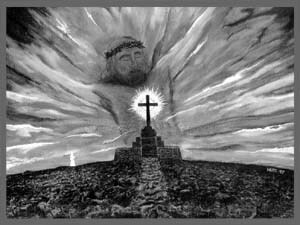 It had what appeared to be an image of Christ in the clouds above the Cross on Krizevac. "Being an artist, I combined what I saw in the two photographs into a painting. It took me a whole month to do it. I went to Church first and prayed and asked for God's blessings on it. Often, I cried as I painted." 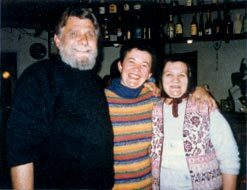 The following year, Bruce returned to Medjugorje, again staying at Vicka's. He presented her with a copy of the painting. "This framed print of my painting remains in Vicka's sitting room today," Bruce declares. Today Bruce is a daily communicant, he prays the rosary, fasts, belongs to prayer groups and goes to Adoration. Most of all, he spends time with his son. "My son, Shane, has never uttered a word but I read his eyes. He's taught me more than anyone I've ever known."